Hot air ballooning is on the top of many travellers’ bucket lists and it’s not hard to see why! 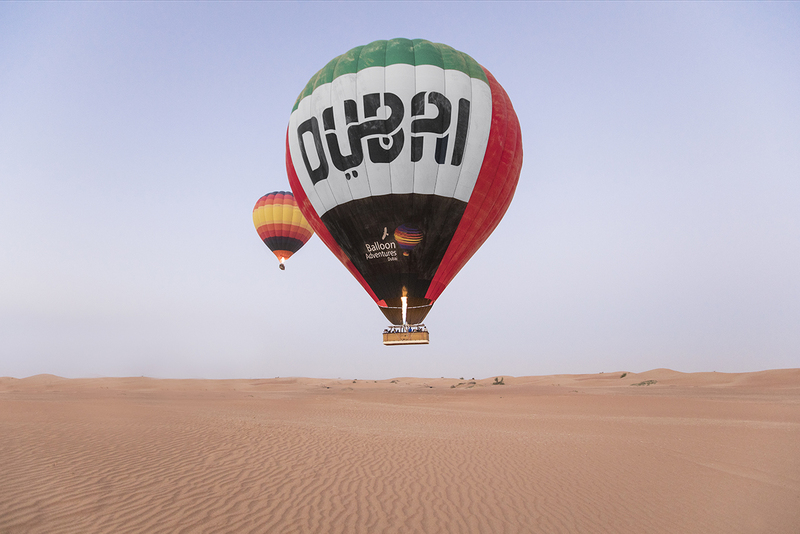 Dubai is one of the best places in the world to experience a Hot Air Balloon ride for many reasons. Experiencing the vastness of the Dubai desert at 3000-4,000ft is especially magical. 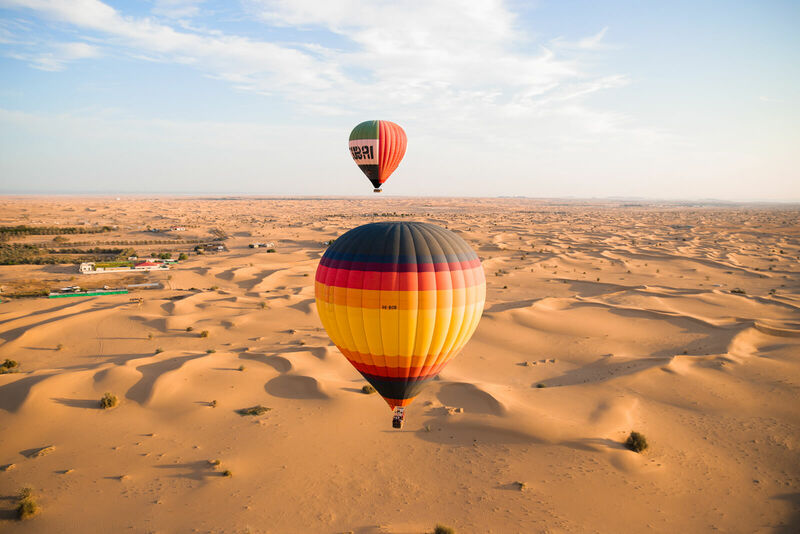 A Hot Air balloon flies with the wind and from where Balloon Adventures Dubai takes off, you may go over the huge 225km2 Dubai Desert Conservation Reserve spotting pristine rolling sand dunes in all directions. Other desertscapes are just as spectacular with crops, villages and camel farms littered through the desert. The sunrise over the desert is breath-taking as the sunlight reflects a range of hues across the sand dunes. The colours are soft reds just as the sun comes up, changing to vibrant yellows as the sun gets brighter. The Hajar mountains on the border of Oman perfectly frame the scene creating a stunning backdrop and perfect photography opportunities. As you travel along on your approximately 1-hour balloon ride, you can spot Arabian animals such as camels, the Arabian oryx and gazelles. The Arabian oryx were at a point of extinction but with conservation efforts and specialised breeding programs, these beautiful creatures thrive in their natural habitat. Dubai is the only place in the world where you get to fly with falcons. Balloon Adventures Dubai is the only Hot Air Balloon Company that offers this spectacular show. 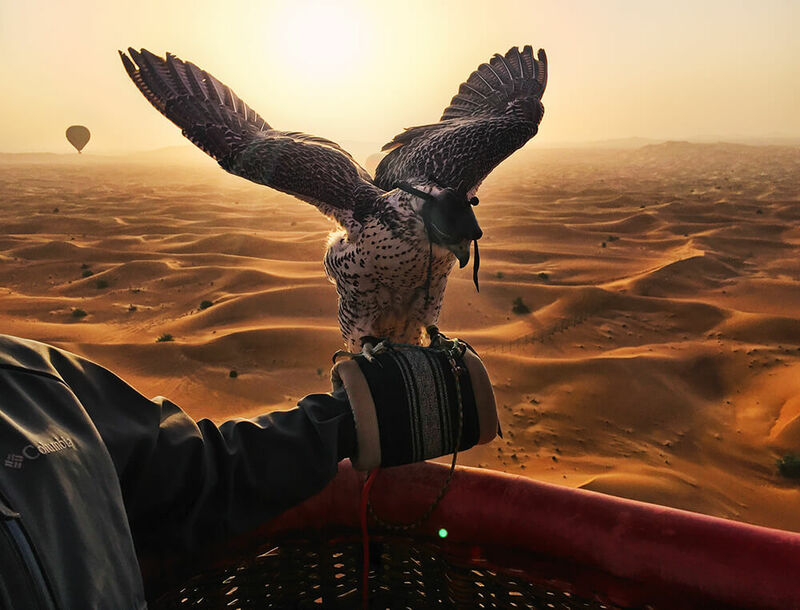 Falconry is strongly rooted in the cultural heritage of the UAE and experiencing these majestic creatures soaring around the balloon basket in full flight while you float across the desert is a truly once-in-a-lifetime experience. 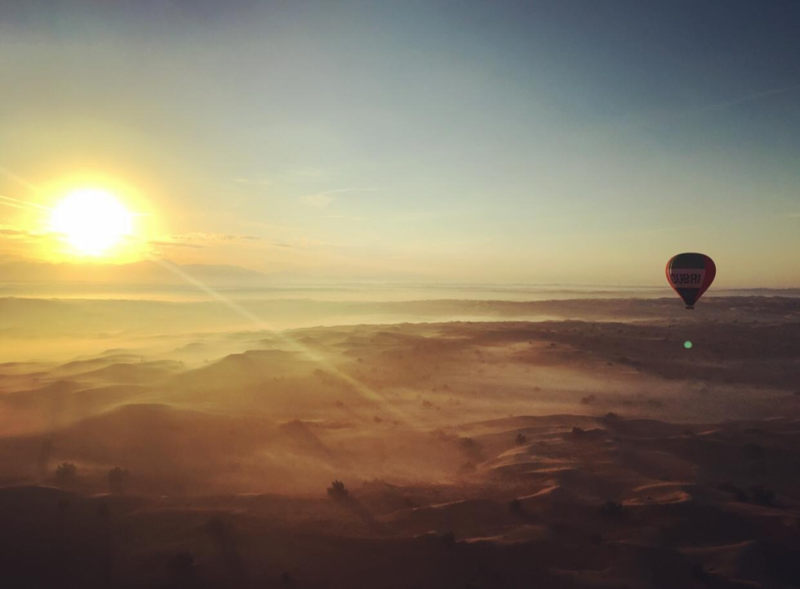 A Hot Air Balloon Ride over the Dubai desert also offers some of the most beautiful photo opportunities. Influencers, celebrities and the World’s Media want to capture the perfect shot from the balloon. It is hard not to take good pictures from a Hot Air Balloon – even photographs taken with camera phones are turned into masterpieces. After the Hot Air Balloon ride, you also get to experience a delicious breakfast of smoked salmon, eggs Benedict and more in a traditional Bedouin camp in the middle of the desert. 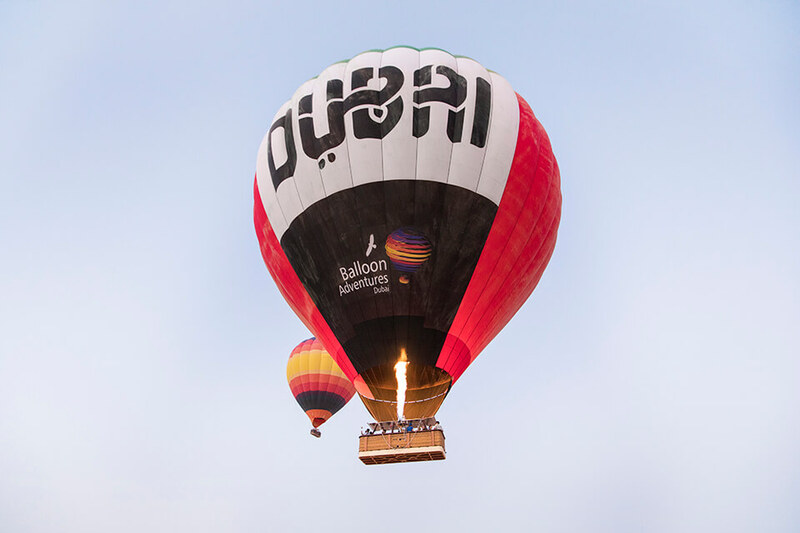 Dubai is a special and unique place to experience a Hot Air Balloon ride.